After Arlian and Woolley, 1970.
of habitat space. Hermanniella moved into the litter (Ao) layers while the Nothrus population increased in the F (A;) layer. Several lines of evidence—gut analyses, feeding trials in cultures, chemical considerations—suggest that oribatid mites, as a group, are fungal feeders. Some exceptions exist, such as the phthiracarid group, which may tunnel into coniferous needles or twigs and ingest the spongy mesophyll. Others bore into the pedicels of oak leaves (Hansen, 1999). These species may contain a gut flora of bacteria that allow them to digest decomposing woody substrates. Possibly, their nutrition is derived from bacteria or fungi embedded in the woody tissue. Examination of gut contents for most other oribatids shows that they feed primarily on fungi. 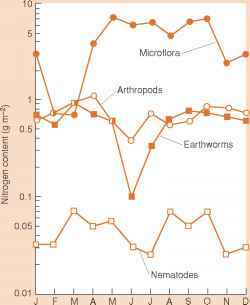 A survey of 25 species from the North American arctic found that more than 50% were panphytophagous (feeding on microbes and plant debris), but nearly all contained fungal hyphae or spores. Similarly, a study of Irish species found that 15 of 16 species were generalist feeders, having both fungi and plant remains in their guts (Behan and Hill, 1978; Behan-Pelletier and Hill, 1983). Occasional fragments of collembolans were discovered in some of the guts. Morphology of the chelicerae seems related to feeding type (Kaneko, 1988). Xylophagous (wood-feeding) species have large, robust chelicerae. Fragment feeders are generally smaller and have smaller chelae. Further refinement of guild designations for oribatid mites has been made, based on their digestive capabilities as evidenced by their cellulase, chitinase, and trehalase activity in field populations (Siepel and de Ruiter-Dijkman, 1993). Using these three enzymes, it was possible to recognize five major feeding guilds: herbivorous grazers, fungivo-rous grazers, herbo-fungivorous grazers, fungivorous browsers, and opportunistic herbo-fungivores. In this classification, grazers are species which can digest both cell walls and cell contents; browsers can digest only cell contents. Siepel and de Ruiter-Dijkman (1993) also recognized two minor guilds: herbivorous browsers and omnivores. Further work with other groups of gut enzymes may provide additional information concerning resource utilization, and fungal feeding in particular, by guilds of oribatid mites. This is a most rewarding area for research in biodiversity, considering the multitude of species and niche dimensions for oribatids in forest floor habitats (Anderson, 1975; Hansen, 2000). The oribatids themselves are prey for some insects such as scyd-maenid beetles (Molleman and Walter, 2000), pselaphid beetles (Park, 1947), or ants (Matsuko, 1994). Some vertebrates such as salamanders have been found to contain oribatids in their guts. 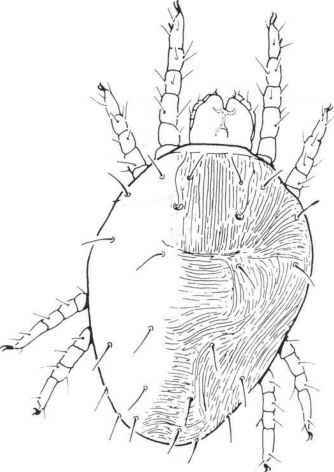 In general, the hard exoskeleton of oribatid mites protects them from smaller predators such as prostigmatic and mesostigmatic mites (see later section). Oribatid mites can affect organic litter decomposition and nutrient dynamics in forest floors, but they appear to do so indirectly by grazing on microbial populations or fragmenting plant detritus, and thus influencing the decomposition process (Petersen and Luxton, 1982; Seastedt, 1984b). Calcium dynamics may be an exception, because oribatid mites can store and process a significant portion of the calcium input in forest litterfall (Gist and Crossley, 1975). Several mechanisms of microarthro-pod-microfloral interaction have been proposed (Lussenhop, 1992), including consequences of selected grazing, dispersal of fungal spores or inocula, and stimulation of fungal growth or bacterial activity. The importance of oribatid mites, as with other fauna, cannot be interpreted outside the context of the entire suite of soil biota. The milieu of decomposer organisms, vegetable matter in various stages of decomposition, and localized "hot spots" of activity requires careful analysis and is a focus of important current research (Edwards, 2000; Hansen, 2000; Moore and de Ruiter, 2000; Bolger et al., 2000). The Prostigmata contains a large array of soil species (Fig. 4.22). Many of these species are predators, but some families contain fungalfeeding mites and these may become numerous. Like the oribatids, prostigmatic mites are an ancient group with fossil representatives from the Devonian era. Keys to families of Prostigmata (also known as Actinedida) are provided by Krantz (1978) and Kethley (1990). Some families of prostigmatic mites include species which are predators, microbial feeders, plant feeders, or parasites (Kethley, 1990). The fungal feeding species (such as members of the family Eupodidae) are opportunistic, able to reproduce rapidly following a disturbance or a sudden shift in resources. Small species of Prostigmata are the common mites of Antarctic soil surfaces, of drained lake beds with algal blooms, of plowed and fertilized agricultural fields, of tidal marshlands or burned prairie soils, and so forth (Lussenhop, 1976; Luxton, 1967, 1981; Perdue and Crossley, 1989; Seastedt, 1984; Strandtmann, 1967; Tevis and Newell, 1962). Species in the families Eupodidae, Tarsonemidae, Nanorchestidae, and some of their relatives feed on algae or fungi; their populations may grow rapidly to large sizes. In these situations, the Prostigmata may become more numerous than the oribatid mites. In general they are more numerous in temperate than in tropical or subtropical habitats (Luxton, 1981b). FIGURE 4.22. Prostigmatid mite: family Tydeidae (Lorryia sp.) (after Krantz, 1978). dae were important regulators of nematode populations in desert soils of the southwestern United States. Some of the smaller predatory species may utilize fungi on occasion. Walter (1988) observed predation on nematodes by prostigmatic mites in the families Bimichaelidae and Alicorhagiidae; members of the latter family also ingested fungal hyphae but with lower reproductive success. Many types of fungalfeeding Prostigmata have small, stylet chelicerae and may simply pierce fungal hyphae (members of the Nanorchestidae and Nemataly-chidae families) (Walter, 1988). That author also examined gut contents in slide mounts of more than 500 small prostigmatic mites collected in various localities in North America and elsewhere. Many of these specimens contained a fungal food bolus (Table 4.6). Both fungal feeding and predation on nematodes appear to be widespread among the tiny Prostigmata. Kethley (1990) lists the known feeding habits of 30 families or superfamilies of soil-inhabiting Prostigmata, and summarizes their biology, ecology, and type of habitat. In general, the larger predaceous Prostigmata feed upon other arthropods or their eggs; the smaller species are nematophagous. Some Prostigmata have well-defined patterns of predation. The "grasshopper mite," Allothrombium trigonum, feeds exclusively upon grasshopper eggs; the larval stages of the mite are parasitic on grasshoppers. The large red "velvet mites" (Dolicothrombium species), which erupt in numbers following desert rains, are predaceous on termites. The pestiferous "chiggers" are the larval stages of mites in the family Trombiculidae; the adults are predaceous on collembolans and their eggs. Collembolans may be an important diet item for the larger Prostigmata such as members of the families Bdellidae, Cunaxidae, and the trombidioid families.